In an email I received recently, a reader asked me where on the Chesapeake Bay they’d find St. Dennis, and I had to reply that the town existed only in my head, much as Devlin’s Light, NJ (another place people ask for directions to!). The next question was, is there a place on the Chesapeake that inspired St. Dennis, and I had to think back to when I first started the Chesapeake Diaries. Years ago, my husband and I had spent a day in St. Michaels, which at the time was just beginning to grow into the tourist magnet it is now. We’d also made a few stops in Rock Hall, which at the time had been a somewhat sleepy little bay town (different now). Chesapeake City hadn’t been revived those years ago, and Chestertown was still a college town that needed a little revitalization. Now, in 2018, they all offer so much to see and do, great restaurants, beautiful historic districts. When I first started envisioning St. Dennis, it had been more like those earlier days of the towns I just mentioned, but over the years, as those towns evolved, so did St. Dennis. Now St. Dennis is all spiffed up, with the Inn at Sinclair’s Point now being the destination spot on the Chesapeake, more excellent restaurants, new shops and a newly restored historical district. But I missed the rustic charm of the early town I’d created — and so Cannonball Island was born. Cannonball Island is home to a small population of descendants of the early settlers of the island who were forced out of St. Dennis for supporting the British during the War of 1812 (if you’ve read the series, you know the whole story). The island has no real government, no mayor, but 101-year-old Ruby Carter has her finger on the pulse of everything that goes on there. She’s wise and snarky as only a woman who’s lived for over one hundred years can be. She’s one of those characters who walked out of the story and onto the page as I was writing it. I’d had no thought of her before I started writing THAT CHESAPEAKE SUMMER, but she had a mind of her own then, and she has a mind of her own now! Along with her bff Grace Sinclair, Ruby has become one of my most beloved characters — everyone adores her, but no one wants to mess with her. It’s a shame one character in DUNE DRIVE never quite understood that. Not saying another word except to say, if you read DUNE DRIVE, you’ll know it when you see it. And I’ll say this — I don’t think writing any other scene has ever given me as much satisfaction! 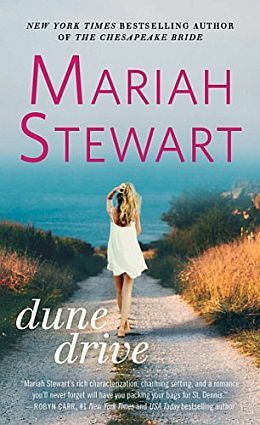 DUNE DRIVE picks up where THE CHESAPEAKE BRIDE left off, with Owen and Lis Parker’s cousin Chrissie Jenkins. She’d come to the island for a family wedding but for her, the trip had been for more than a family reunion. In returning to Cannonball Island, she forever left behind the abusive relationship she’d been in for five years. Once under her great-grandmother’s wing, Chrissie could breath and restart her life, find her sense of self, and heal. She’s been damaged but not destroyed, bent but not broken, and her journey to find herself is one of the best things I’ve ever written. Jared Chandler is the son of Gordon Chandler, who you met in PRICELESS lo, these many years past (like, 1999!). With Gordon pretty much retired, Jared is taking over the family marine salvage business. An old friend of Owen Parker, he’s called on to salvage what he can from a merchant ship that sunk off Cannonball Island in the time leading up to the American Revolution. Jared carries his own form of damage: his mother, a concert pianist, abandoned him and his sister — and their father — during a tour of Europe, and never returned. He’s been a player all his adult life because he’s pretty sure that’s the way to protect himself from heartbreak. He and Chrissie have something in common besides their battered souls: they’re both outsiders in St. Dennis. With neither of them looking for a “relationship”, a true friendship develops as they explore the town together. When Jared needs a date for a family wedding that’s set to extend over a long weekend, he invites his good friend Chrissie, not for a moment realizing their relationship is about to take an unforeseen turn. I hope you get a chance to pick up DUNE DRIVE. I hope you love Chrissie’s and Jared’s story as much as I do. It just might become one of your favorites of the Chesapeake Diaries, as it has one of mine. PS: For fans of the Enright series — there’s a wedding in DUNE DRIVE that you’re not going to want to miss! Hint: it’s been a long time coming! PPS: If you missed THE SUGARHOUSE BLUES, Book #2 in the Hudson Sisters series, when it went on sale on May 15 — it’s still available, as is THE LAST CHANCE MATINEE, Book #1 in that series. THE GOODBYE CAFÉ, the third book (Allie’s book! ), will go on sale on March 26, 2019, with the most gorgeous cover EVER!